· All stainless steel construction. · Holland No-Hassle five year warranty. 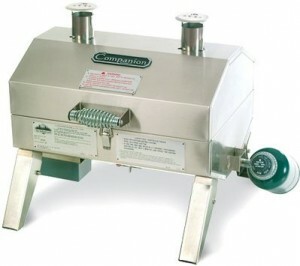 · Exclusive patented Holland Grill system prevents flare-ups. Guaranteed! · Holland’s drip pan is between the food and the flame – so food can’t catch on fire. Drippings strike the drip pan and sizzle, giving the food its distinctive Holland Grill flavor. · 212 square inches of cooking surface. · Expanded stainless steel cooking grid provides plenty of room for your feast. · Low/Medium/High adjustable burner settings (2600 btu to 4900 btu). · Uses 1 lb. disposable tank (not included). Tank lasts approximately 4 hrs. on High, 5 hrs. on Medium and 6 hrs. on Low. · Conversion hose accessory available to use 20 lb. LP tank.